At the end of the fall growing season, right before the first killer frost (which was late this year), we harvest the last of our peppers and tomatoes and collect some from local farm stands, trying to stretch the season as far as possible. Tomatoes are fully ripened from a nutritional point of view when the color “breaks,” so many recommend harvesting them at that stage no matter the time of year. Set aside, away from the light, for a few days, the full color develops and they don’t get starchy. This technique works perfectly for the last locals. 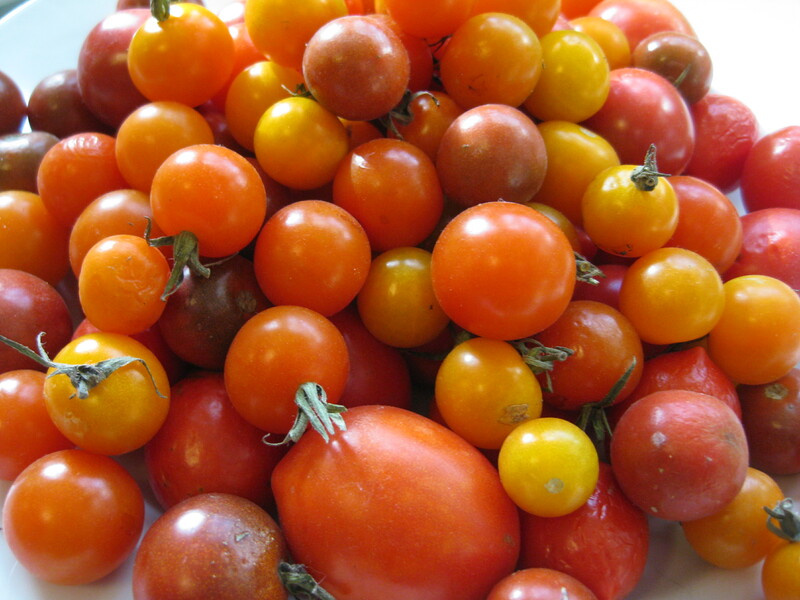 In addition to a couple of medium-sized heirloom tomatoes, I have a bowlful of cherry tomatoes that have been ripening at various rates well into the third week of December when I wrote this. 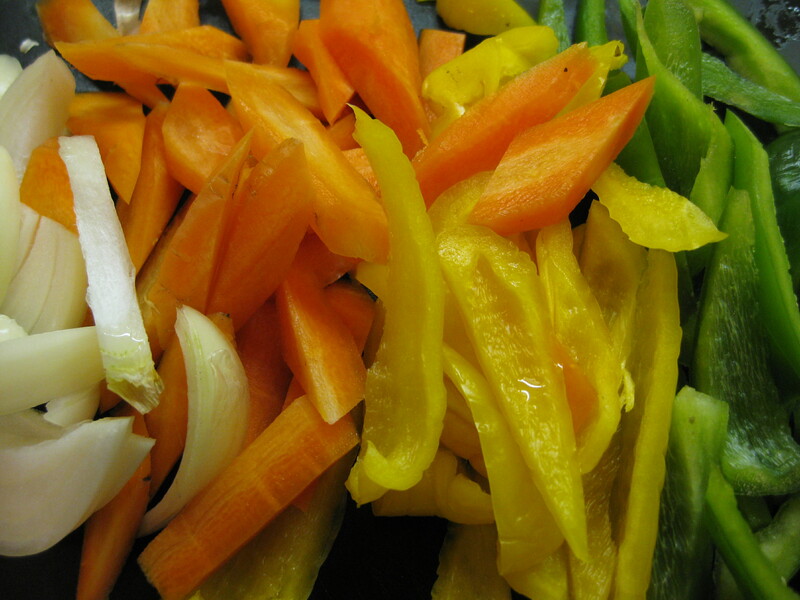 The same goes with multi-colored organic bell peppers. We’ve been eating the peppers and tomatoes, simply sautéed, on disks of roasted white and sweet potatoes, a SOLE-ful appetizer. 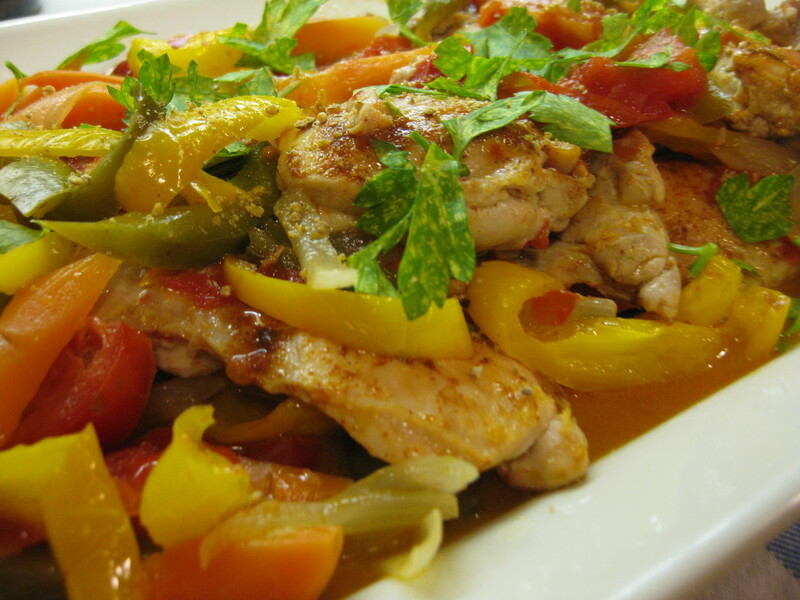 Since we are able to get excellent organic, local and ethically raised chicken and I had a meat-eating crowd coming for a pre-holiday dinner, I decided to make a comforting standby, chicken cacciatore, or “hunter’s style” chicken. I skinned and boned the chicken thighs for this recipe, preferring a dash of olive oil over chicken fat as a rendering medium. However, sometimes I leave the skin and bones intact and use no oil. I always have homemade turkey or chicken stock (frozen) on hand and for this meal I added the bones to it to simmer before proceeding with the dish. We have numerous local vineyards for the traditional addition of white wine, so I was set. Typically, the chicken would be floured before sautéing but I leave it out whenever my wheat-free daughter is here. Adding it would also have detracted from the otherwise very local meal. We served the chicken sauté with mashed rutabagas mixed with a little potato to keep the texture creamy and a garnish of the last of my own parsley snatched from an icy ending in the garden. Sauté the chicken thighs in a little olive oil until browned, add a little salt and pepper, and remove them to a warm plate while preparing the vegetables. Saute the onion and peppers in the drippings in the pan, scraping up the browned pieces. Add the garlic and stir. As soon as the garlic is aromatic, add the white wine and stir to deglaze the pan and evaporate most of the liquid. 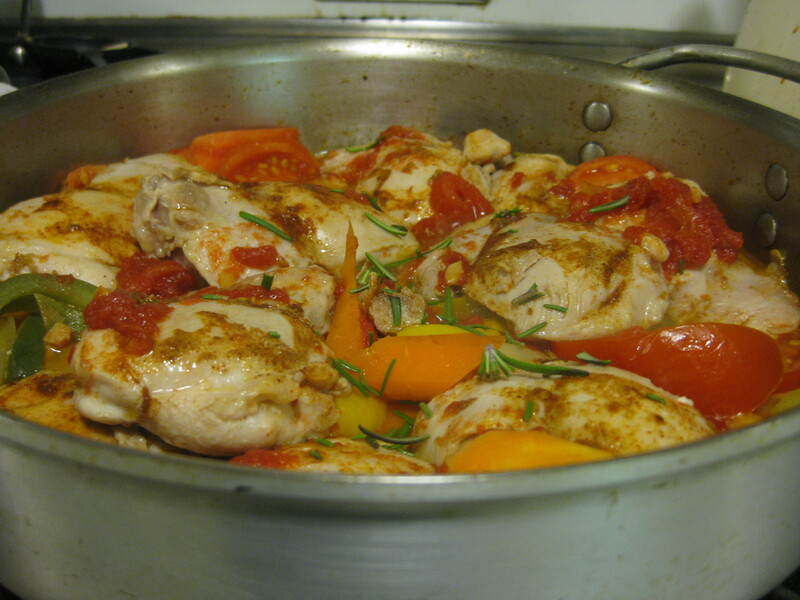 Add the chicken thighs back to the pan, spread around the carrots, tomatoes and herbs, and pour the chicken stock over the mixture. Simmer, covered, for about 20-25 minutes or until the chicken is cooked through. Adjust the seasonings and serve garnished with a little fresh parsley. Serves 4.